Community Health Workers (CHWs)are lay people from the community, who have been trained to function as members of the health care team; they function as a bridge between patients and the health care system. CHWs advocate, facilitate and organize access to health and social services for an identified group of patients. They serve as liaisons between high risk, high cost patients and their health care providers. They are available to visit patients in their home, and accompany them to clinical appointments. CHWs have frequent contact and conduct follow up with patients. The goal is to demonstrate improved care, improved health and lower costs. Two educational institutions have joined together in partnership with Temple University Health System to develop the curriculum and offer effective training for Community Health Workers. These partners include Temple University’s Center for Social Policy and Community Development under the College of Public Health and District 1199C Training and Upgrading Fund. The training model moves learners through a process from acquiring knowledge, to analyzing underlying constructs, to applying and synthesizing learned materials, and to being self-evaluative. While the actual functions of Community Health Workers may vary by size and type of practice, healthcare specialty, or patient needs, all Community Health Workers must possess fundamental competencies to be successful in the role of working with patients towards the overarching goal of increasing appropriate utilization of health care services, particularly among under-served populations. Six months of on-the-job training component, 4 hours per week. 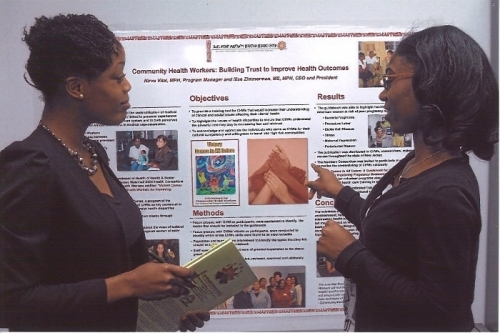 Community Health Workers Training requires participants to commit to 120 hours of training.